Norway's Oil Fund Heads For $1 Trillion; So Where Is Alberta's Pot Of Gold? Every man, woman and child in oil-rich Norway became a theoretical millionaire this week. The country’s oil fund — which collects taxes from oil profits and invests the money, mostly in stocks — exceeded 5.11 trillion crowns ($905 billion) in value this week, making it worth a million crowns per person, or about $177,000 per Norwegian. That’s right. Norway, the “socialist paradise,” is effectively running a surplus of nearly a trillion dollars, thanks to oil revenue. About the same time this happened, the Canadian Taxpayers Federation released calculations showing that the taxpayers of Alberta are on the hook for $7.7 billion in debt, or about $1,925 per person. It expects the debt to spike to $17 billion by the end of the 2015-2016 fiscal year. The CTF is so alarmed by the province’s descent into deficits that it has launched a debt clock specifically for Alberta. What's wrong with this picture? 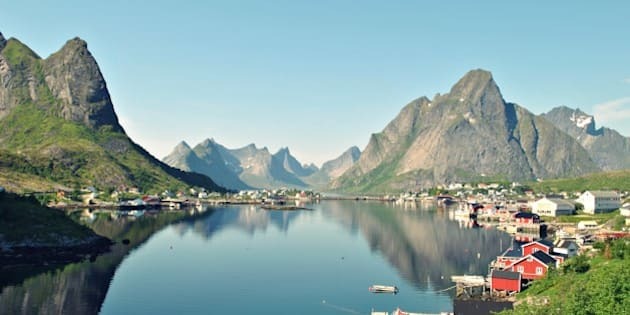 Norway, with an economy and population somewhat larger but on the same scale as Alberta's, has managed to guarantee its citizens' prosperity for decades to come. Norway's oil production is declining, down to one-half what it was in 2001. Alberta, where oil production keeps growing and growing, is writing IOUs. Norway isn’t the only one, though its fund is the largest. The United Arab Emirates’ funds are valued in excess of US$800 billion, Kuwait has about US$400 billion, and Russia and Kazakhstan have accumulated about US$180 billion each. These facts should renew the long-running debate about whether the federal government or the provincial governments of oil-rich provinces should set up the sort of sovereign wealth fund that has made Norway stupendously, incomprehensibly rich. But are Albertans, or other Canadians, ready for the sort of reforms that would turn Alberta into the new Norway? In socialist-leaning Norway, oil profits — including from state-run Statoil — are taxed up to a whopping 78 per cent, and that’s where the seed money for the fund comes from. Alberta, meanwhile, never even had a provincial sales tax. Albertans pay far, far lower taxes than Norwegians, and if conventional economic theory is right, this should give Alberta the advantage. The average total income in Alberta is around $53,000, well below the province's (stunning) economic output of $80,000 per person. Norway's economic output is actually much lower than Alberta's, at $65,000 per person, but its average income is about the same, at $58,000. Norwegians take home a much larger chunk of the economy's wealth than Albertans do. The Alberta government blames its deficit on the “bitumen bubble.” Oilsands product is selling for considerably less than conventional crude, mostly because of the boom in shale oil production in the U.S. It was selling for 22 per cent less than West Texas Intermediate oil as of this week, and this, apparently, is putting pressure on Alberta's finances. But this is a sad excuse. Norway, too, has had to deal with low oil prices over the decades, but always found the political will to feed its rainy day fund. Alberta “was just greedy and decided that a drunken, blow-out dance party today was better than a string of candle-lit dinner parties down the road,” writes noted economics reporter Eric Reguly in Corporate Knights. Had Alberta set up a proper sovereign wealth fund decades ago as Norway had — or even if it were simply willing to draw higher royalties — it could use that money to stay out of deficits. It wouldn’t have to go begging to the federal government for aid when flooding hits. This isn’t news to policymakers. The IMF, the Canadian International Council (CIC), and a recent University of Saskatchewan report are among those recommending Canadian governments set up sovereign wealth funds. “The arguments in favour were just so logical,” said Melanie Drohan, co-author of a CIC report favouring oil funds, in an interview with iPolitics. Some parts of the country are listening. British Columbia Premier Christy Clark last year announced the creation of a wealth fund that will collect profits from the proposed development of the liquified natural gas (LNG) industry on the west coast. It won’t be anywhere near the size of Norway’s fund; the B.C. government projects it will collect $100 billion of a projected $1 trillion in LNG wealth generated over the next 30 years. Then again, the LNG business in B.C. isn’t expected to be as large as Norway’s oil business. But aside from B.C., there is little interest among elected officials. The Harper government has roundly rejected the creation of a federal sovereign wealth fund. And in Alberta, the idea of a sovereign wealth fund appears to have come and gone. The province came close when then-Premier Peter Lougheed set up the Heritage Savings Fund back in 1976. But the province didn't take it seriously at all. After a decade in operation, Alberta's government basically stopped paying into it, instead drawing on it as another source of revenue. It stands today at a measly $16.7 billion, a tiny fraction of what Norway has accumulated. Incidentally, the fund's size is about what Alberta’ debt is projected to be in a couple years. The province could just give up the ghost, raid the fund and pay off the debt. It won’t help make Alberta a more fiscally responsible place in the future, but at least it will temporarily eliminate the unforgivable embarrassment of Canada’s wealthiest, most economically dynamic province showing the world how to waste its wealth.